Washington, D.C. — Speaking slowly in his thickly accented English, Benny Gantz addressed the annual AIPAC policy conference on Monday morning. Despite his accent, Gantz, who as co-leader of the centrist Blue and White party is locked in a neck-and-neck race with Israeli Prime Minister Benjamin Netanyahu, spoke fluently and naturally as he moved around the stage — until he tripped over one word: bipartisanship. Gantz was not alone in his struggle with bipartisanship. After years of garnering support from both sides of the aisle, AIPAC has come under increasing scrutiny from the left flank of the Democratic Party. 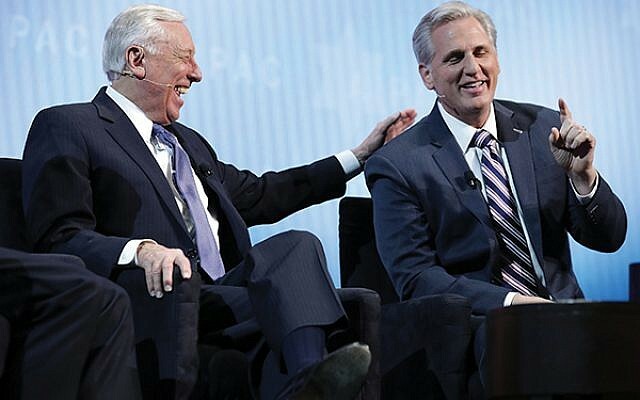 Facing an increasingly partisan environment in Washington, at its conference this year AIPAC leaders walked a shaky tightrope between celebrating the organization’s bipartisan friends and castigating those it views as failing to adequately support it and Israel. One member of Congress, Ilhan Omar, the freshman representative from Minnesota, loomed particularly large over the conference despite her absence at the sprawling Walter E. Washington Convention Center. Though her name was rarely mentioned, Omar’s rhetoric about Israel and AIPAC, a source of continued frustration in the Jewish community in recent months, was repeatedly invoked from the opening session of the conference on Sunday to its closing session on Tuesday. While Republicans condemned her remarks and the Democratic leadership for failing to adequately sanction her, Democrats distanced themselves from her with full-throated denouncements of anti-Semitism and support for the U.S.-Israel relationship. Even Netanyahu, joining the conference by a glitchy video stream after cutting short his trip to the U.S. due to rocket attacks in Israel, joined Omar’s critics. “Take it from this Benjamin, it’s not about the Benjamins,” he said, a slap at Omar for her tweet suggesting that politicians’ support of Israel was all about Jewish money. At the same time, speaker after speaker repeatedly stated that support for Israel remains bipartisan. 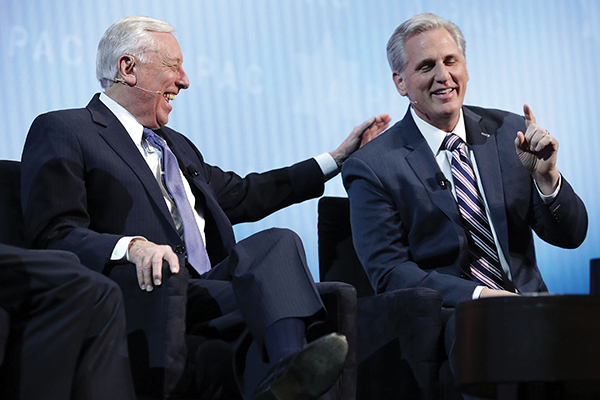 AIPAC’s ability to draw bipartisan support has become an open question under the conservative Trump administration and as AIPAC’s own members have moved farther to the right. Several attendees noted that the conference has become more dominated by Orthodox attendees, the only Jewish denomination over the past five years to vote Republican and to approve of Trump’s performance in large numbers. “It’s obvious from this conference that AIPAC is facing and will continue to face a serious challenge on bipartisanship, particularly if the era of Trump and Netanyahu is to continue,” said Debra Shushan, director of policy and government relations at Peace Now. Jewish Federation of Greater MetroWest NJ was well represented at the conference with about 700 local attendees, according to Linda Scherzer, director of Federation’s Community Relations Committee. She said the group included 40 parents and students who were sent to the conference through a Federation grant, and an almost 80-student delegation from the Rae Kushner Yeshiva High School in Livingston, one of three high schools in the country to receive the AIPAC National Early Exemplar Award in recognition of high school leaders who have done the most to advance AIPAC’s mission this year. Another Federation highlight was a visit by a MetroWest delegation of 50 to Congressman Tom Malinowki’s (D-Dist. 7) office. Talk of the report by Special Counsel Robert Mueller, delivered on Friday afternoon to Attorney General William Barr, who wrote to Congress on Sunday that there was no evidence of collusion between the Trump administration and the Russian government during the election two years ago, made the partisan split even clearer. Pence also celebrated the Trump administration’s agenda on Israel over the previous year, including moving the United States embassy from Tel Aviv to Jerusalem, pulling out of the Iran deal, and recognizing Israeli sovereignty in the Golan Heights. Though security experts largely agree that Israeli control of Golan Heights is a necessity for the security of northern Israel, last week’s announcement was seen as a political gift to Netanyahu, who is facing a tough challenge in Israeli elections that come just two weeks after the AIPAC conference. On Monday, the president signed the proclamation alongside Netanyahu. a reference to the longstanding Israel-diaspora tensions over egalitarian prayer at the Kotel. AIPAC had been criticized for inviting Netanyahu after he encouraged a coalition between Israel’s right-wing parties and the Meir Kahane-inspired Otzmah Yehudit, a move that AIPAC itself criticized. Shira Hanau is a staff writer for The New York Jewish Week, NJJN’s sister publication. NJJN Staff Writer Jed Weisberger contributed reporting.